Infanta Maria das Neves of Portugal (Portuguese: Maria das Neves Isabel Eulália Carlota Adelaide Micaela Gabriela Rafaela Gonzaga de Paula de Assis Inès Sofia Romana, Infanta de Portugal) (5 August 1852 – 15 February 1941) was the eldest child and daughter of exiled Miguel of Portugal and his wife Adelaide of Löwenstein-Wertheim-Rosenberg. Maria was born in Kleinheubach, an Infanta of Portugal and member of the House of Braganza by birth. Until the birth of her brother Miguel, Duke of Braganza, Maria was titled Princess Royal of Portugal, a title of pretense, given her father had been deposed in 1834. Through her marriage to Alfonso Carlos of Bourbon, Duke of San Jaime, Carlist claimant to the Spanish throne, Maria was titular Queen consort of Spain, France, and Navarre. Maria married Alfonso Carlos of Bourbon, Duke of San Jaime, second son of Juan, Count of Montizón and his wife Archduchess Maria Beatrix of Austria-Este, on 26 April 1871 in Kleinheubach. Alfonso Carlos was her first cousin once removed, as Maria's father (Miguel of Portugal) and his paternal grandmother (Infanta Maria Francisca of Portugal) were siblings. Their union produced only a son who died some hours after his birth, in 1874. They were unable to have more children and died childless. Maria died in Vienna, Austria, aged 88. ^ a b c d e f g h i Darryl Lundy (5 June 2004). "Maria das Nieves de Bragança, Infanta de Portugal". ThePeerage.com. Retrieved 2008-11-23. ^ a b c d e f g h i j Paul Theroff. "PORTUGAL". Paul Theroff's Royal Genealogy Site. Retrieved 2008-11-23. The generations indicate descent form Afonso I, and continues through the House of Aviz, the House of Habsburg through Infanta Isabel, Holy Roman Empress and Queen of Spain, and the House of Braganza through Infanta Catarina, Duchess of Braganza. Philip of Spain was Duke of Parma from 1748 to 1765. He founded the House of Bourbon-Parma, a line of the Spanish branch of the dynasty. He was a son-in-law of Louis XV, born at the Royal Alcazar in Madrid, he was the third child and second son of Philip V of Spain and his wife, Elisabeth Farnese. He was raised in Madrid and as a child showed more interest in art than in politics and his mother came from the family of Farnese, which had ruled the Duchy of Parma and Guastalla for many generations. The duchy had been ruled between 1731 and 1736 by his elder brother Charles, but was exchanged with Austria for The Two Sicilies after the War of Polish Succession. Twelve years later, in the Treaty of Aix-la-Chapelle, Austria lost the duchy and Philip became the new duke, the Duchy of Parma was ruined by many years of warfare, and in 1759 Philip named the able Frenchman Guillaume du Tillot as his minister to restore the economy. Philip was a ruler who stimulated education and philosophy, attracting personalities like Étienne Bonnot de Condillac. Austria, officially the Republic of Austria, is a federal republic and a landlocked country of over 8.7 million people in Central Europe. It is bordered by the Czech Republic and Germany to the north and Slovakia to the east and Italy to the south, the territory of Austria covers 83,879 km2. The terrain is mountainous, lying within the Alps, only 32% of the country is below 500 m. The majority of the population speaks local Bavarian dialects of German as their native language, other local official languages are Hungarian, Burgenland Croatian, and Slovene. The origins of modern-day Austria date back to the time of the Habsburg dynasty, from the time of the Reformation, many northern German princes, resenting the authority of the Emperor, used Protestantism as a flag of rebellion. Following Napoleons defeat, Prussia emerged as Austrias chief competitor for rule of a greater Germany, Austrias defeat by Prussia at the Battle of Königgrätz, during the Austro-Prussian War of 1866, cleared the way for Prussia to assert control over the rest of Germany. In 1867, the empire was reformed into Austria-Hungary, Austria was thus the first to go to war in the July Crisis, which would ultimately escalate into World War I. 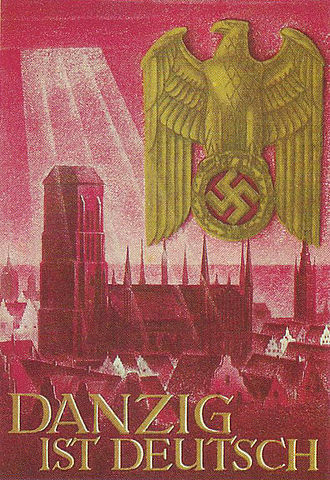 The First Austrian Republic was established in 1919, in 1938 Nazi Germany annexed Austria in the Anschluss. 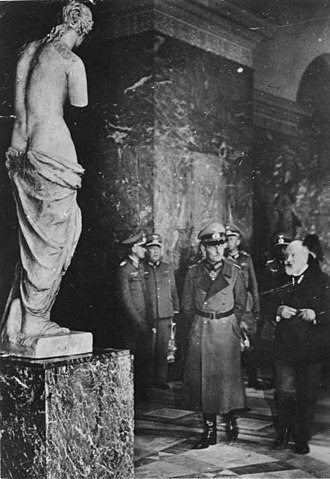 This lasted until the end of World War II in 1945, after which Germany was occupied by the Allies, in 1955, the Austrian State Treaty re-established Austria as a sovereign state, ending the occupation. In the same year, the Austrian Parliament created the Declaration of Neutrality which declared that the Second Austrian Republic would become permanently neutral, Austria is a parliamentary representative democracy comprising nine federal states. 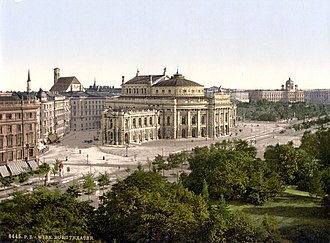 The capital and largest city, with a population exceeding 1.7 million, is Vienna, other major urban areas of Austria include Graz, Linz and Innsbruck. Austria is one of the richest countries in the world, with a nominal per capita GDP of $43,724, the country has developed a high standard of living and in 2014 was ranked 21st in the world for its Human Development Index. Mariana Victoria of Spain was an Infanta of Spain by birth and was the Queen of Portugal as wife of King Joseph I. 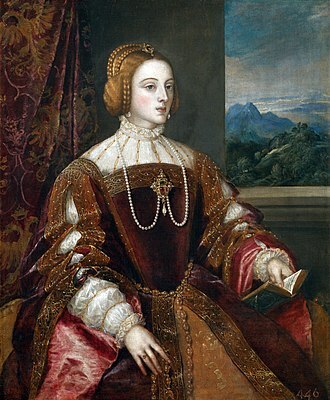 The eldest daughter of Philip V of Spain and Elisabeth Farnese, rejected due to her age, the marriage never took place and she was sent back to Spain. In 1729 she was married to the son of John V of Portugal, as the mother of Maria I of Portugal, she acted as regent of Portugal during the last months of her husbands life and acted as advisor to her daughter in her reign. Mariana Victoria was born at the Royal Alcazar of Madrid in Madrid and was given the same forenames as her paternal grandmother Maria Anna Victoria of Bavaria and she was an Infanta of Spain by birth and the eldest daughter of Philip V of Spain and his second wife Elisabeth Farnese. Her father was a grandson of Louis XIV and had inherited the Spanish throne in 1700, as an Infanta of Spain she had the style of Royal Highness. 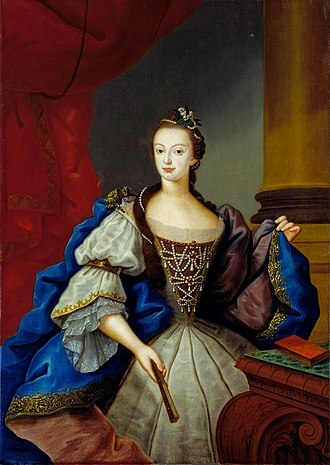 After the War of the Quadruple Alliance and Spain decided to reconcile by engaging the Infanta Mariana Victoria to her first cousin the young Louis XV of France, saint-Simon, the French ambassador, requested her hand on 25 November 1721. The exchange of the young Infanta and Mademoiselle de Montpensier was on the Île des Faisans and was the site was where their ancestors, Louis XIV. 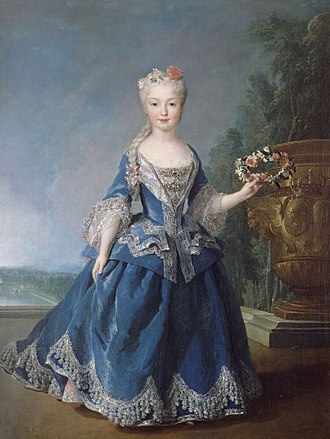 Mariana Victoria arrived in Paris on 2 March 1721 amongst much celebration, the young Infanta was nicknamed the linfante Reine as the couple were not to be married till Mariana Victoria reached a more mature age. Mariana Victoria was in awe of Louis XV and was popular with the court apart from the king himself who avoided her presence. According to the mother of the Régent, Elizabeth Charlotte of the Palatinate and her education was placed in the care of Marie Anne de Bourbon, an illegitimate daughter of Louis XIV and Louise de La Vallière. In February 1723, Louis XV reached his majority and thus governed the country by his own accord and her establishment in France was not to be. 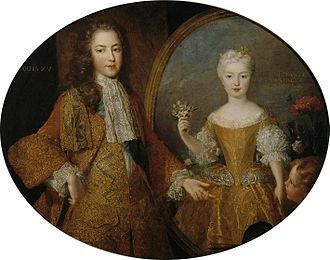 Bourbon had wanted to maintain influence over the young Louis XV and offered his sister Henriette Louise de Bourbon as a wife who. The situation was not helped by the Spanish rejection of Louise Élisabeth dOrléans whose husband died having ruled as Louis I of Spain for only seven months. Dom John V, known as the Magnanimous and the Portuguese Sun King, was a monarch of the House of Braganza who ruled as King of Portugal and the Algarves during the first half of the 18th century. John Vs reign saw the rise of the prestige of Portugal and its monarchy, John Vs reign saw an enormous influx of gold into the coffers of the royal treasury, supplied largely by the royal fifth that was received from the Portuguese colonies of Brazil and Maranhão. John nearly depleted his countrys tax revenues on ambitious architectural works, most notably Mafra Palace, disregarding traditional Portuguese institutions of governance, John V ruled as an absolute monarch. On the imperial front, John V pursued an expansionist policy, with significant territorial gains in Portuguese India, John V was a very pious man who devoted large parts of his day to prayer and religious study. He rewarded his long-awaited recognition as a monarch by Pope Benedict XIV with a fervent devotion to the Catholic Church. The Pope granted John V the style Most Faithful Majesty, which appealed to him greatly, Johns relationship with the papacy varied at different periods in his reign, there were both close relations and conflicts at different times during the reigns of five different popes. John was born on 22 October 1689 at Ribeira Palace in Lisbon to King Pedro II and he was baptized on November 19 at the Royal Palace Chapel and given the name João Francisco António José Bento Bernardo. John was not his fathers first son, he had a brother, João, Prince of Brazil. Upon his baptism, John was not given the titles of the heir apparent to the Portuguese throne, Prince of Brazil and Duke of Braganza. This was intended as a sign of respect for his brothers death. John had a stimulating upbringing surrounded by some of the most brilliant minds of Europe at the time. It was agreed by the court that Johns care as a child was to be run by women only, a custom of the Portuguese court. Johns governess was Maria de Lencastre, the Marquise of Unhão, the political policies of Johns father had made the Portuguese court wealthy, the national economy stable, and the imperial military strong. This made a varied and interesting childhood possible for John. As a child, he was under the tutelage and heavy influence of the Jesuit Fathers Francisco da Cruz, John Seco, and Luís Gonzaga. Karl Ludwig, 3rd Prince of Hohenlohe-Langenburg was the third Prince of Hohenlohe-Langenburg. He was the first child of Prince Christian Albert of Hohenlohe-Langenburg and his wife, Princess Caroline of Stolberg-Gedern. From 1815 to 1825, he held a seat in the Estates Assembly and since 1820 the First Chamber of the reorganized Estates, on 30 January 1789 at Kliczków Castle, he married Countess Amalie Henriette of Solms-Baruth, daughter of Count John Christian II of Solms-Baruth. Grand Duke Henri of Luxembourg is a descendant of Adelaide of Löwenstein-Wertheim-Rosenberg through her daughter, king Philippe of Belgium is a descendant of Adelaide of Löwenstein-Wertheim-Rosenberg through her daughter, Infanta Marie Jose of Portugal, mother of Elisabeth of Bavaria, Queen of Belgium. King Carl XVI Gustaf of Sweden is a son of Sibylla of Saxe-Coburg and Gotha, king Willem-Alexander of the Netherlands is a grandson of Bernhard of Lippe-Biesterfeld, a great-great-grandson of Charles Louiss daughter, Emilie. The House of Habsburg, called House of Hapsburg, or House of Austria, was one of the most influential royal houses of Europe. 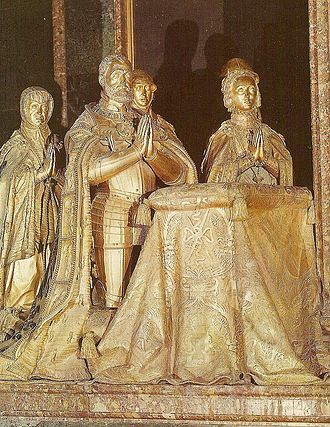 The throne of the Holy Roman Empire was continuously occupied by the Habsburgs between 1438 and 1740, from the sixteenth century, following the reign of Charles V, the dynasty was split between its Austrian and Spanish branches. Although they ruled distinct territories, they maintained close relations. The House takes its name from Habsburg Castle, a built in the 1020s in present-day Switzerland, in the canton of Aargau, by Count Radbot of Klettgau. His grandson Otto II was the first to take the name as his own. The House of Habsburg gathered dynastic momentum through the 11th, 12th, by 1276, Count Radbots seventh generation descendant Rudolph of Habsburg had moved the familys power base from Habsburg Castle to the Duchy of Austria. Rudolph had become King of Germany in 1273, and the dynasty of the House of Habsburg was truly entrenched in 1276 when Rudolph became ruler of Austria, which the Habsburgs ruled until 1918. A series of dynastic marriages enabled the family to expand its domains to include Burgundy and its colonial empire, Hungary. In the 16th century, the separated into the senior Habsburg Spain and the junior Habsburg Monarchy branches. The House of Habsburg became extinct in the 18th century, the senior Spanish branch ended upon the death of Charles II of Spain in 1700 and was replaced by the House of Bourbon. It was succeeded by the Vaudemont branch of the House of Lorraine, the new successor house styled itself formally as the House of Habsburg-Lorraine, although it was often referred to as simply the House of Habsburg. His grandson Radbot, Count of Habsburg founded the Habsburg Castle, the origins of the castles name, located in what is now the Swiss canton of Aargau, are uncertain. There is disagreement on whether the name is derived from the High German Habichtsburg, or from the Middle High German word hab/hap meaning ford, the first documented use of the name by the dynasty itself has been traced to the year 1108. Maria Luisa of Parma was Queen consort of Spain from 1788 to 1808 as the wife of King Charles IV of Spain. She was the youngest daughter of Philip, Duke of Parma and his wife, Princess Louise-Élisabeth of France, born in Parma, she was christened Luisa Maria Teresa Anna, but is known to history by the short Spanish form of this name, María Luisa. Her parents had been the Duke and Duchess of Parma since 1749 and she, her brother Ferdinand, and her sister Isabella were educated in Parma by Étienne Bonnot de Condillac, a well-known French philosopher. María Luisas mother tried to engage her to Louis, Duke of Burgundy, the young duke died in 1761. In 1762 Maria Luisa instead became engaged to Charles, Prince of Asturias, King Charles IV of Spain, as there was no queen in Spain at that time, María Luisa became the first lady in precedence at the court from the beginning of her residence there. Her husband was the son and heir of the widowed Charles III of Spain, previously Duke of Parma and King of Naples, due to pressure from Napoleon I, Marías husband abdicated the throne of Spain and spent the rest of his life in exile. Dona Maria I was Queen of Portugal and the Algarves. Known as Maria the Pious, or Maria the Mad, she was the first undisputed Queen regnant of Portugal, with Napoleons European conquests, her court, under the direction of Prince Dom João, the Prince Regent, moved to Brazil, a Portuguese colony. Later on, Brazil would be elevated from the rank of a colony to that of a kingdom, with the formation of the United Kingdom of Portugal, Brazil. Maria was born at the Ribeira Palace in Lisbon and baptized Maria Francisca Isabel Josefa Antónia Gertrudes Rita Joana, on the day of her birth, her grandfather, King John V of Portugal, created her the Princess of Beira. Maria grew up in a time when her fathers government was dominated completely by the first Marquis of Pombal and her father would often retire to the Palace of Queluz which was given to Maria and her husband. The Marquis took control of the government after the terrible 1755 Lisbon earthquake of 1 November 1755, after the earthquake, Marias father was often uncomfortable at the thought of staying in enclosed spaces, and suffered from claustrophobia. The king had a built in Ajuda, away from the city centre. This palace became known as Real Barraca de Ajuda because it was made of wood, the family spent much time at the large palace, and it was the birthplace of Marias first child. In 1794 the palace burned to the ground and the Palace of Ajuda was built in its place, in 1760 Maria married her uncle Pedro, younger brother of her father Jose I. They had six children, of whom the eldest surviving son succeeded Maria as João VI on her death in 1816, in 1777, Maria became the first undisputed queen regnant of Portugal and the Algarves. With Marias accession, her husband became king as Peter III, despite Peters status as king and the nominal joint reign, the actual regal authority was vested solely in Maria, as she was the lineal heir of the crown. Also, as Peters kingship was iure uxoris only, his reign would cease in the event of Marias death, Maria is considered as having been a good ruler in the period prior to her madness. Noteworthy events of this period include Portugals membership in the League of Armed Neutrality, Queen Maria suffered from religious mania and melancholia. Alfonso Carlos was the second son of Infante Juan of Spain, Count of Montizón and Archduchess Maria Beatrix of Austria-Este. Since his parents separated when he was young, he and his brother were raised in Modena under the tutelage of his maternal uncle Duke Francis V of Modena. In 1868 Alfonso Carlos joined the Papal Zouaves which had formed to defend the Papal States from the army of the Kingdom of Italy. In 1869 he was promoted to the rank of lieutenant, in September 1870 he fought for the pope during the Capture of Rome where he defended the Porta Pia. When he was ordered to surrender, he refused to give up his sword which had belonged to his grandfather Carlos V and he escaped to Toulon in a French naval ship. In 1872 Alfonso Carlos joined the armies of his older brother Carlos, Duke of Madrid and he was appointed commanding general of the Royal Army of Catalonia and distinguished himself at the Battle of Alpens in July 1873 and the siege of Cuenca in July 1874. In spite of successes, the Carlists eventually lost the war which was over by February 1876. Alfonso Carlos spent most of the rest of his life in Austria where he owned castles at Puchheim and at Ebenzweier near Altmünster, and he devoted himself to the abolition of duelling. In order to gain support, he wrote a book on the topic in French. He used his social contacts to encourage the establishment of anti-duelling leagues in the German Empire, Austria, Hungary, Belgium. On October 2,1931, at the age of 82, Alfonso Carlos succeeded his nephew Jaime, Duke of Madrid as Carlist claimant to the throne of Spain and he issued several manifestos to his Spanish followers including one in August 1932 and another in June 1934. He affirmed that he would be succeeded by whoever follows me according to the Salic law, when the Spanish Civil War broke out, Alfonso Carlos instructed his Carlist followers to cooperate with the Nationalists under the command of General Francisco Franco. 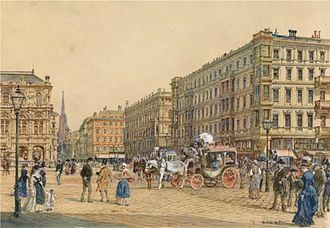 On September 28,1936, Alfonso Carlos was hit by a truck as he crossed a street in Vienna. His body was buried in the chapel of his castle at Puchheim, the obituary for Alfonso Carlos in The Times described him as a great gentleman. She was the mother of thirteen children, many of whom died in childhood. A popular consort, she oversaw the construction of the Caserta Palace outside Naples as well as other projects in her husbands domains. Moving to Spain in 1759, she set about the improvements to the Royal Palace of Madrid. Maria Amalia was politically active and openly participated in affairs in both Naples and Spain. She was born at Dresden Castle in Dresden, the daughter of Augustus III of Poland, Elector of Saxony and Maria Josepha of Austria, herself daughter of Joseph I and her mother was the first cousin of Empress Maria Theresa. The infant was baptised with the names Maria Amalia Christina Franziska Xaveria Flora Walburga and her youngest sister, Princess Kunigunde was a possible wife for the future Philippe Égalité. She grew up at the court of Dresden and was educated in French and she was an accomplished musician and sang and played the keyboard from an early age. In 1738 Maria Amalia became engaged to Charles, King of Naples and Sicily, the impenetrable secret negotiations had taken place earlier in Vienna, where the Dowager Empress Wilhelmina Amalia, grandmother of Maria Amalia, played an important part in the negotiations. 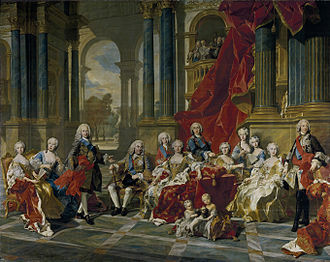 The Spanish ambassador in Vienna, Count Fuenclara, acted on behalf of the courts of Madrid and Naples, in December 1737, a papal dispensation was made, and the marriage announced in the beginning 1738. 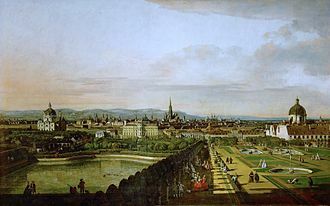 On May 8,1738, Maria Amalia had a ceremony at Dresden with her brother, Frederick Christian of Saxony. Since this marriage was looked upon favorably by the papacy, it soothed the diplomatic disagreements between Charles and the Papal states, on July 4,1738, Maria Amalia arrived at Naples and to what was described as a euphoric welcome. The couple met for the first time on June 19,1738 at Portella, at court, festivities lasted till July 3 when Charles created the Royal order of San Gennaro – the most prestigious chivalric order in the kingdom. He had the Order of Charles III created in Spain on 19 September 1771, despite being an arranged marriage, the couple became very close, it was noted and reported to her mother-in-law in Spain, that Charles seemed happy and pleased when he first met her. The Palace of the Dukes, in Guimarães, was seat of the House of Braganza from 1420 until Fernando II of Braganza was executed for treason by King João II in 1483. Jaime I restored the Braganzas' status after his father's execution and built the Ducal Palace of Vila Viçosa. In 1640, John IV of Portugal became the first Braganza to reign as King of Portugal, starting the Portuguese Restoration War. Two typical Carlist co-religionists of the 19th century Francisco Solà i Madriguera, of Taradell (Osona), with his son, around 1870. Don Carlos calling the Navarrese in 1833. The first appearance of the word "Ostarrîchi", circled in red. Modern Austria honours this document, dated 996, as the founding of the nation. 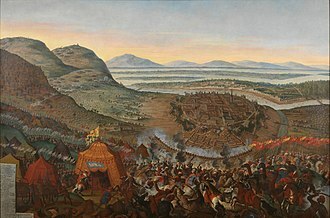 The Battle of Vienna in 1683 broke the advance of the Ottoman Empire into Europe. Portrait by Pompeo Batoni, c. 1707. John, Duke of Braganza; c. 1706. John aged around 17 years. Portrait of King John V with a Crown; 1707. John aged 18 years. Portrait of John for the Exchange of the Princesses; Jean Ranc, 1729. The Infante John, Lord of the Infantado, Infante of Portugal, c. 1785. D. Maria Francisca, Princess of Beira, Duchess of Barcelos; Pavona; 1739. Maria Francisca Isabel, Princess of Brazil; Vieira Lusitano, 1753. 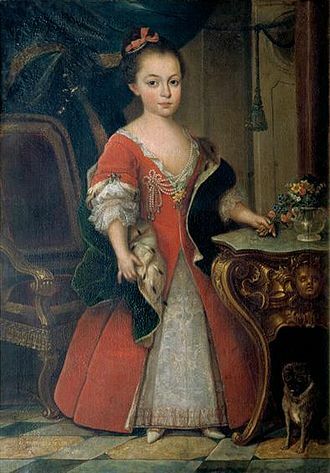 Infanta Carlota Joaquina, by Anton Raphael Mengs, ca. 1775-76. Infanta Carlota Joaquina at the time of her betrothal, by Mariano Salvador Maella, 1785. 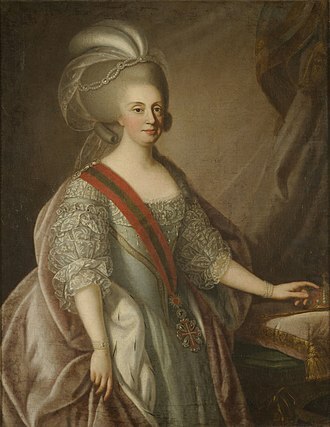 Carlota Joaquina, Duchess of Beja, by Giuseppe Troni, 1787. Queen Victoria Eugenie, in 1918, with her six children: (from left to right) Infanta Maria Cristina, Alfonso, Prince of Asturias, Infante Gonzalo, Infante Juan, Infante Jaime and Infanta Beatriz. The bronze statue of Empress Isabella by Leone Leoni, 1550-1555, that was commissioned by Charles V, on display at the El Prado Museum, Madrid. Maria Amalia overlooking the Neapolitan crown, by Giuseppe Bonito, c. 1745. The family of the Duke of Parma. Portrait of Joseph, Prince of Brazil; Domenico Duprà, 1725. The Marriage between Joseph I and Mariana Victoria of Spain; Pieter Schank, 1727. Infante Alfonso Carlos and his wife Maria das Neves of Portugal. The Hippopotamus at the Regent's Park Zoo, ca. 1855. Photo by Juan, Count of Montizón. Maria Beatrix with her siblings; her sister Maria Theresa is painting a portrait of her.